The word Pindapata is one of those many words that suffer when translated from Thai to English. Words like alms gathering, alms round, alms giving, Buddha Bowl, begging bowl, baht, baat, bat pata etc are almost impossible to accurately translate from Thai to English both in spelling and pronunciation, let alone meaning. One of the major issues is that the Thai Alphabet has 44 consonants, 15 vowel symbols that combine into at least 28 vowel forms, and four tone diacritics. Source Wikipedia. Considering the English language has just 21 consonants and 5 vowels it sometimes becomes a bit of a guessing game to try and fit such a wide variety of sounds into such a narrow receptacle. Bearing this in mind, as I write some of these posts I will try and rely on descriptions rather than attempt direct translations. I will however attempt to explain the most common terms as they are most often translated. For example a bhikkhu is an ordained Buddhist Monk who is over 20 years old. A bhikkhuni is a fully ordained Buddhist Nun who will be dressed in white and have her head shaved. 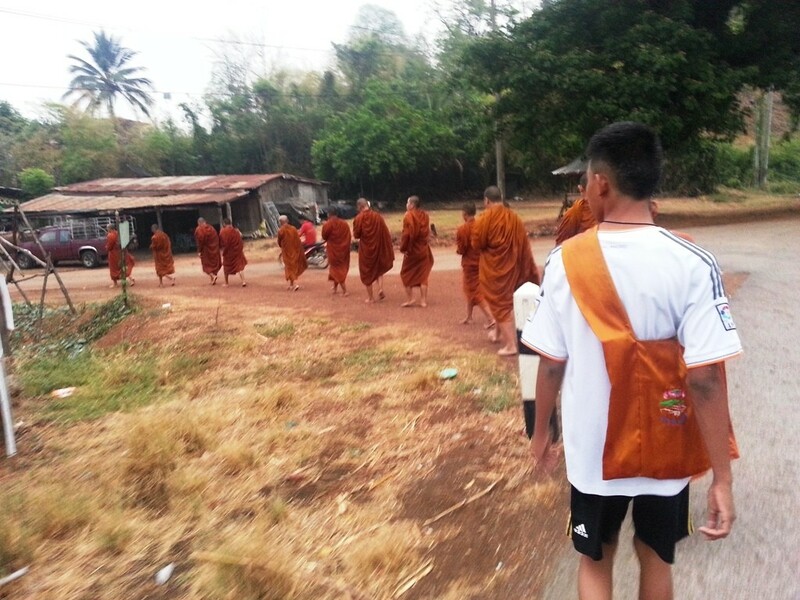 In my last post I talked about walking with some Buddhist Monks early in the morning as they walked through the local village gathering food from, and distributing food to, the people of the village. The monks carry a bowl which is sometimes in western writings referred to as an alms bowl, a Buddha Bowl or a begging bowl. I like to use similar sounding words from the English language that they sound something like the Thai word, as the Thai people say it. When Thai people talk about the bowl that the Buddhist Monks carry, the word they use sounds like “bart” or “baht” A little like the currency Thai Baht or bart as in Bart Simpson. My observation is that most of the food is given by women. The women drop the food into the bowl. This is literally a drop, not a place, as a female must not touch a monk or touch an object that a monk holds. They must not even brush the robe of the monk. I will talk more about this in another post. Pindapata or if you like, bintabaht, is the action of dropping, or dumping the food into the bowl. I have heard some people say that the monks go begging every morning and these people often refer to the bowl as a begging bowl. From my personal observation I would not classify it as begging. However some people disagree with me on this and insist it definitely is begging. I would say that it depends on how it is done and what is done with the food (or sometimes money) that is given. If the monk has a tendency to keep everything that is given, and gives nothing back to the community, then it is more likely to be seen as begging and the community will give little. If the individual monks or perhaps the temple or monastery that the monks represent, are well respected by the community then the monks do not need to beg. It becomes more a case of how do the monks cope with everything they are given. It is what the monks do with the food and gifts that appears to be the main concern. 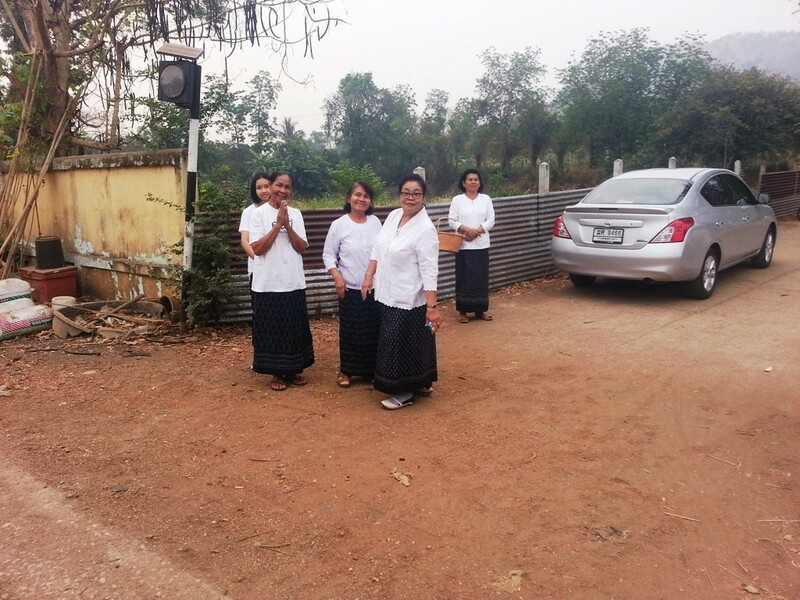 In the case of the Buddhist monks that I walk with, they are well respected within the community and there is ample food given every day to feed everyone in the monastery plus any of the people from the village who are in need of a good nourishing breakfast. If however a Buddhist monk is seen drinking and smoking, wearing elaborate robes, carrying an ornate bowl, or playing games on the latest smart phone, then it is unlikely that anything will be freely given without hesitation. It goes a little like this: The Buddhist monks offer people food for the mind & heart, people offer monks food for the body. It is a mutual sharing relationship that is not measure as a business relationship of “I should receive at least equal to what I give”. When the monks take good care of the people, the people in return take good care of the monks. The Thai Buddhist Monks that I walk with will not directly ask for anything but will present themselves in such a way as to be able to receive offerings. 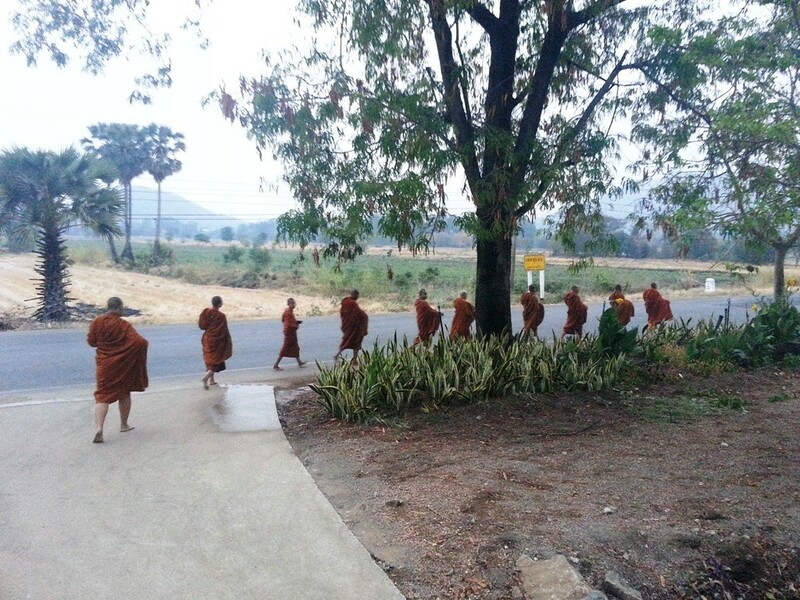 Each morning, at the same time every day, the monks walk barefooted and silently through the village. The bowl is carried on a strap under the robe but the shape of the bowl is visible. The monk does not expose the bowl unless someone makes it evident that they have food to give. At this point the monk will display the bowl and remove the lid allowing the dropping of the food into the bowl. The lid is then placed back on the bowl and the robe once more is draped over the bowl. In the case where there are several monks, the first monk moves on a few paces and the other monks follow the same procedure and do not remove the lid unless it is evident that there is more food for teach monk. The monks walk in order of seniority. This is not age but length of continuous service. The size and makeup of the group may vary. 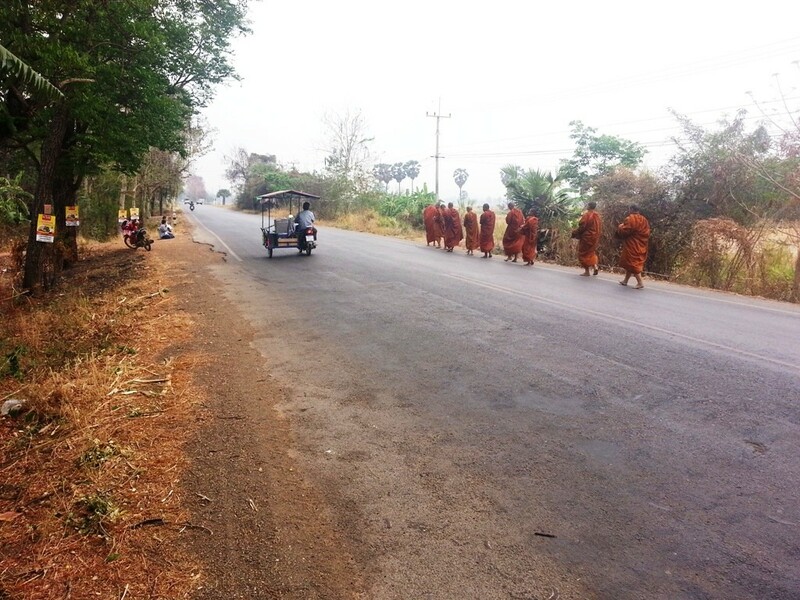 Depending where we are in the village there may be anywhere from 3 to 12 monks. 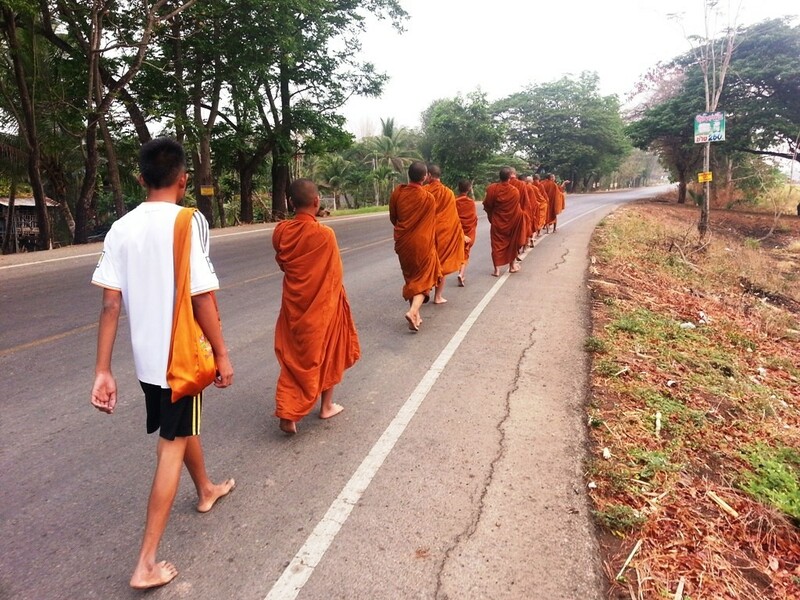 I mentioned in my previous post on Walking With The Buddhist Monks that I made some observations and comments that had an impact on me personally and also the actions of the Buddhists Monks during their walk. The first observation was only minor, and it was due to my physical size. 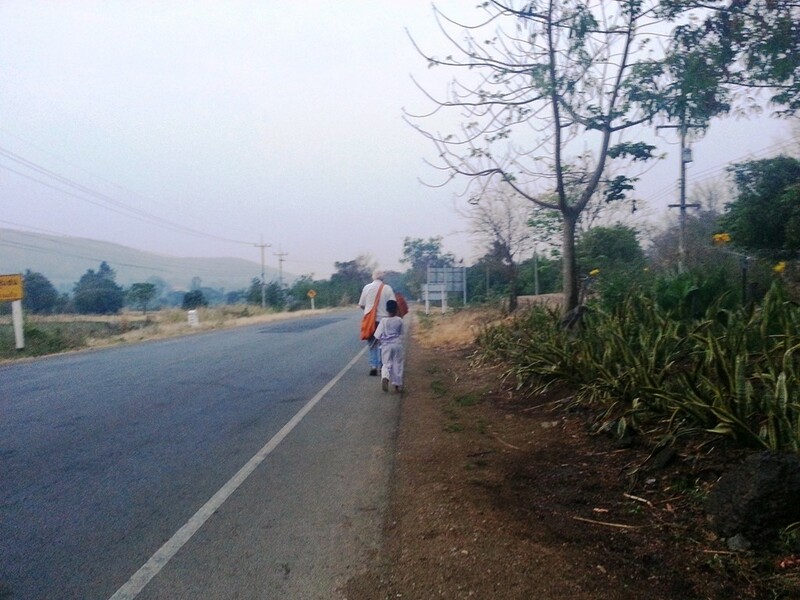 I mentioned, in the previous post, that on the first day I walked, I was given a plastic bag to help carry the excess that did not easily fit into the monk’s bowl. On the second day, I was given a shoulder bag of a similar colour to their robe. This was a quality well-made bag, but unfortunately it was made by a Thai for a Thai. And for me Thai size is a little on the small size. Rather than wearing it as a shoulder bag I needed to wear it as neck bag which, as it filled, was getting close to a nose bag that you would see on a horse. One of the ladies in the village decided that she would make me a bag a little more suitable to my size. The bag was quickly sewn up and, with a few minor adjustments and a few extra modifications, was ready for me the next day. The carrying capacity of this bag is enormous. A watermelon or a couple of dozen mangoes fit inside and there is still room to spare for some bottled water, some bags of boiled rice and some tasty Thai curries. The other observation I made related to the two-way pindapata, that being the giving back of most (or all) of the milk and cookies to the young children. This action depended totally on the villagers giving milk and cookies in the first place. It was not until one of the villagers gave the milk and cookies that they could be given back. Those children towards the end of the walk would get milk and cookies but those at the start missed out. This actually saddened me just a little and I commented to Phat that it would be nice to see some milk and cookies available for all the children. This was discussed with Phra Ajahn and Phat and I offered to bring a small supply of milk and cookies the next day. I was expecting to give these to the monks for them to have available for each child. This was not to be. Phra Ajahn indicated that I keep them in my giant sized shoulder bag and I would have the privilege of giving these to the children and the very elderly. The first morning I arrived with 4 small cartons of milk and 4 small packs of cookies. I expected this would make up the shortfall, but alas I was still two short. The next day I arrived with 6, but was still 2 short. It appeared as if the children were spreading the word that there was a big white guy walking with the monks and that he always appeared to have milk and cookies in his bag. On some days I have flashbacks about a children’s story that was named something like the Pied Piper?. I now carry 10 milk and 6 cookies. This, supplemented by the milk and cookies given throughout the walk, is generally about right. As I am not a Buddhist Monk, there are some of the rules of Pindapata that do not apply to me. For example, a Buddhist Monk must not touch a female or allow a female to touch him. This means that the monk will drop or throw the gift to a female but may hand it to a male. In my case there is no issue with me handing it to either a male or female, young or old. However most times the females may prefer me to place it in their bowl or plate rather than directly in their hands. It is an interesting custom that takes just a little bit of time getting used to. The other thing that I was a little hesitant with was how much touching of the food was appropriate for me. At first I would hold my bag open and expect the monk to drop the food into my open bag. After a while I realised that it was ok for me to take it in my hand and place it in my bag. Now I have a better understanding, it is even acceptable for me to take food from their bowl when they extend the bowl to me with lid removed. The exception is loose boiled rice which is placed in a container when the tricycle arrives. 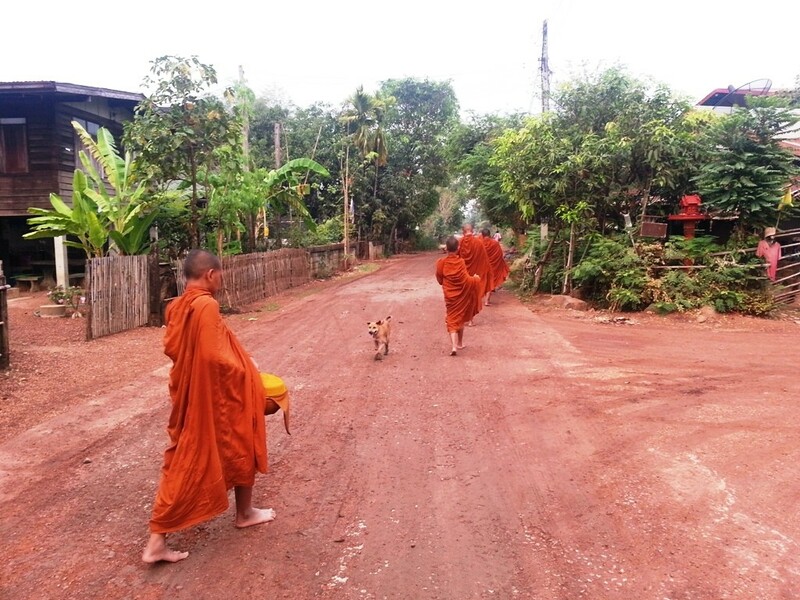 One of the things that the Phra Ajahn like to do is share his food with the village dogs, many of which appear to be not well cared for. He will walk at the head of the group rolling some dried fish or similar in some sticky rice and feeding the dogs and I follow behind getting equal satisfaction from giving milk and cookies to the babies. There will often be rice thrown to other animals especially mother hens and their chicks. Below are a few random pics taken during my walk. This young novice monk had actually cut his heal on something the previous day and although he persevered for the collection of the food, he opted for a ride in the tricycle back to the monastery. Phra Ajahn offering food to a dog. There are several dogs on the morning walk that enjoy a little food passed their way. Phra Ajahn (Sir Teacher) has a way with animals and the dogs at the monastery are cared for much better than at most temples. I could write a complete article on the animal care at the monastery. Perhaps I will at a later date. It is not uncommon for one or more people to arrive by car or motorcycle for the purpose of Pindapata. The ladies in the above photo are regular faces on our morning walks. Some of them do live in the local village and we may see them at their homes but often they may be at another location and will meet us randomly along the way. Often it is near where the motor tricycle can stop as they take Pindapata seriously and often they will overflow the bowls and the carry bags to the point where they need to be offloaded to the tricycle tray. I will add that they are also regulars at the put luck breakfast after the morning service. When you see two ladies kneeling on the side of the road with bags of food, it makes it rather obvious what there intent is. They want to drop goodies into the bowls. 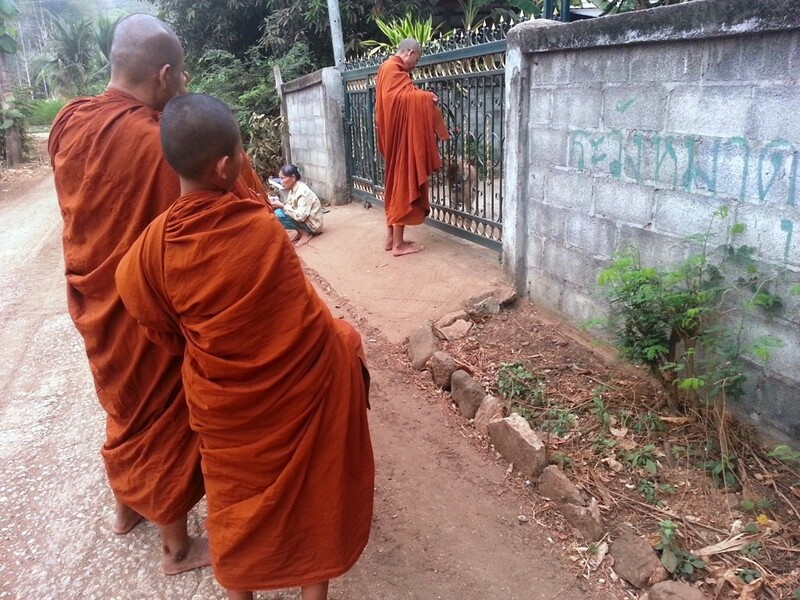 The Thai Buddhist Monks that I walk with definitely do not need to beg for their food. Pindapata in it’s true spirit of sharing is witnessed every morning on my walks. Notice how the head teacher Phra Ajahn has moved on several paces thereby allowing the rest to stand neatly after Pindapata. Notice how the lids are kept on their bowls until the food is offered and then again the bowl is covered with the lid. 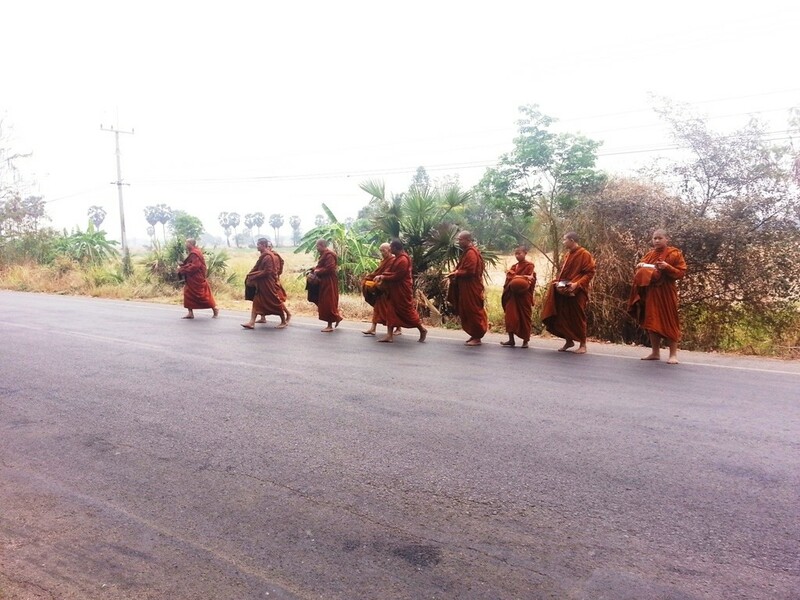 You can see that the third monk from the lead has the lid upturned with a bag of rice on the upturned lid. He has a full bowl and is waiting for me to take the pic and then assist him to carry the excess. These two ladies are also regular participants in the morning Pindapata. What happens after the return to the monastery is for a future article (or two). Yes Luke. the acceptance level has been amazing. The monks, and also the local village people appear to be enjoying it every bit as much as I am. As you know, with the Thai culture, this also means a tremendous amount to Phat.